Thank you for choosing the Axcient Continuity Cloud for Quest. 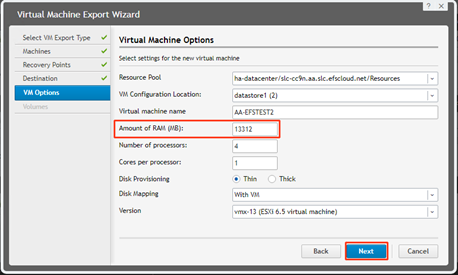 Using the Axcient Continuity Cloud for Quest, you can access fast, off-site virtualization of your replicated VMware servers. 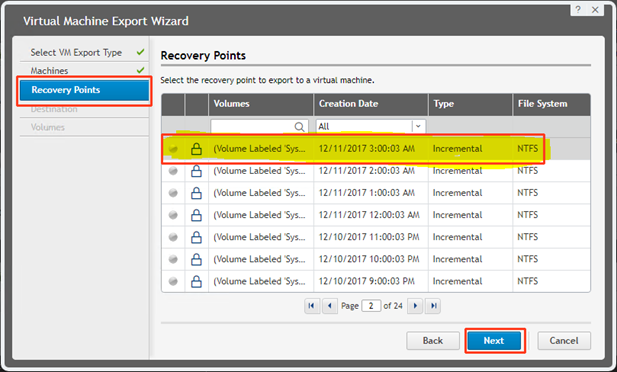 Enable Virtual Standby of your VM’s to the Axcient Continuity Cloud environment, using Quest Rapid Recovery Backup & Replication software. NOTE: Windows operating systems require the Microsoft .NET framework version 4.5.2 to be installed to run the Rapid Recovery Agent service. Operating systems listed above that are marked with * also require the ASP .NET 4.5.x role or feature. 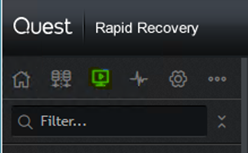 When installing or upgrading the Rapid Recovery Agent software, the installer checks for these components, and installs or activates them automatically if required. At Axcient, we value feedback from our customers. Not only do we want to help you quickly resolve your technical issues, but we value your input and build products that incorporate your suggestions. To contact Axcient Technical Support, call 720-204-4500/1-800-352-0248 or submit a ticket via the Axcient Portal site. 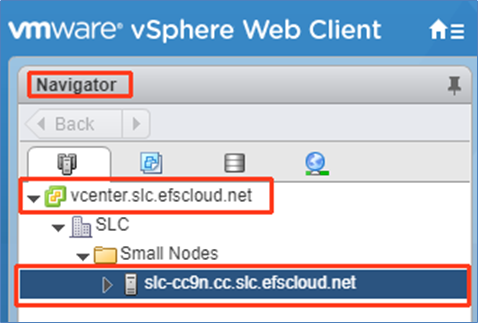 First, connect to the vSphere client that has been assigned to you. Note: If you don’t have Adobe Flash Player installed, you will need to install it before using the Flash based version of the client. After you sign in, a message will pop up saying “You do not have permission to view this object or this object does not exist”. This is because you have not navigated to your node yet; you have only logged into the root vCenter host. On the left side of the screen, you will notice a section called Navigator. Simply click on the down arrow under vCenter and navigate to the host we provided you. export of your data to it. To log in, please use the username of admin (all lower case) and the thirty-character password we sent you. DO NOT use the AD account. The AD account will only work for the vSphere Web Client, which only allows you to access the VM's you exported. Option #1: is a one-time, point-in-time restore. Select the agent in question and choose a recovery point from a desired time and day. This is only a one-time export. Option #2: involves using the Virtual Standby feature. 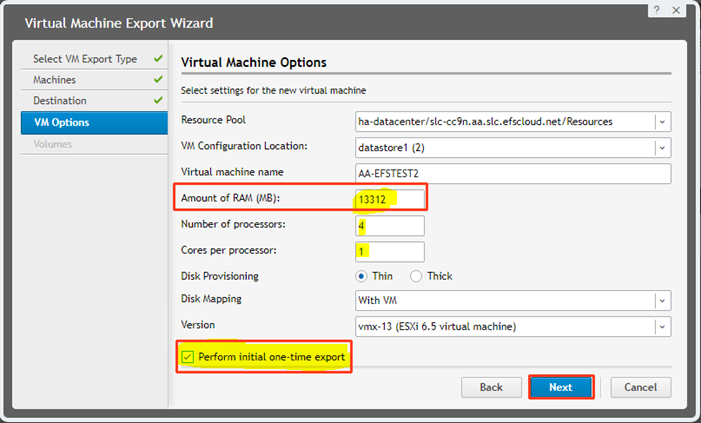 This feature allows you to set up an agent to export the latest incremental data to a VM. As new data comes into the target core, this approach will update the virtual standby created by this process, using the latest data sent over to the target core. We have documented both export steps below in two sections. 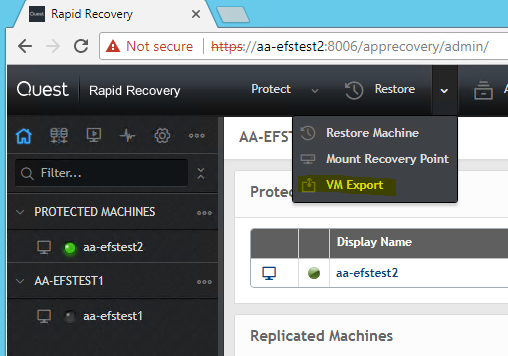 Start out by clicking the Restore tab at the top and choose “VM Export”. 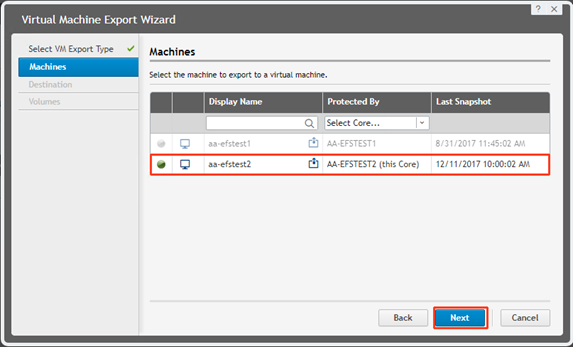 The Virtual Machine Export Wizard Box will pop up as seen below. Choose One-time Export and then click Next. Next, choose the agent you wish to use for the one-time-export. In this case, we will choose AA-EFSTEST2. Now you will need to select the desired Recovery Point. In our test, we will be choosing page 3, with the date of 12/11/2017 @ 3:00:03 AM. Next, under Destination, specify the host IP address that we gave you for your CC Node. In this example, it’s the internal IP of 10.2.24.99. (This will be included in the secure snippet we sent you). Next, please type in the username and password we provided you. Keep in mind that the username must be in all lower case. 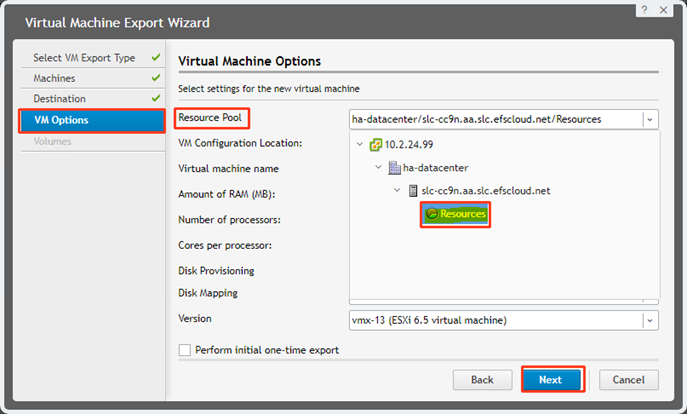 Next, under VM Options, select the Resource Pool dropdown and then select Resources, as shown. Click Next to continue. The next section (Virtual Machine Options) should auto-populate. The rest of the Virtual Machine Option settings can be left at default as shown, unless you would like to change the Number of Processors or Cores per processor values. Next, select the Volumes you want restored. In this case, we will be checking all. This concludes Section 2: ACCESS & EXPORTING DATA. 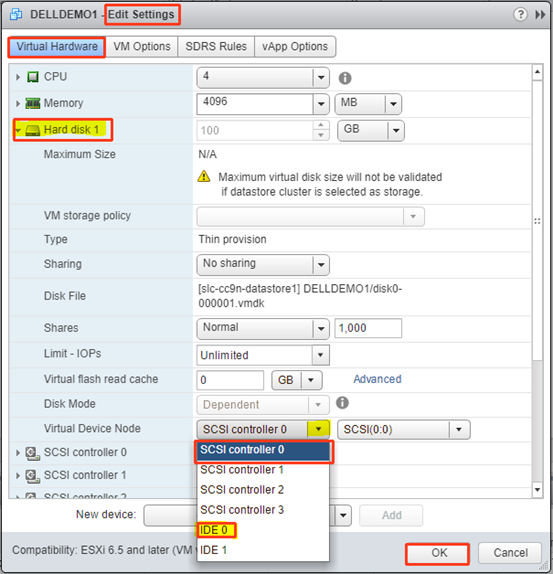 This section covers how to set up an agent for the Virtual Standby feature. This option allows you to set up the agent to export the latest backup. Once set up, any new data replicated over to the target core will then update this Virtual Standby with the latest incremental data the agent has received. 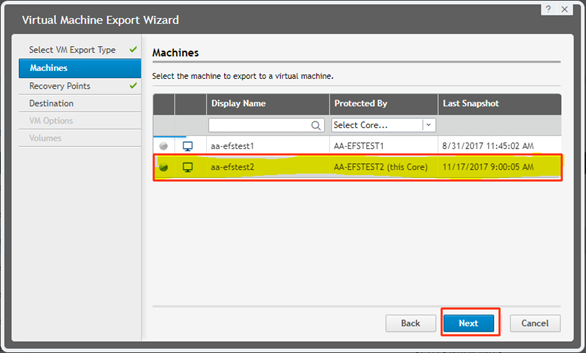 Keep in mind should you decide to start the restored VM, you will need to pause the Virtual Standby export. If you don’t, your core will begin to fill up with errors since it can’t export to a machine that is on. To start, please click on the Virtual Standby section of the Target core GUI. Once on the new section, click “Add” under Virtual Standby. The new Virtual Machine Export Wizard box will then pop up. Select the agent you want to set up. In this case, we will choose aa-efstest2. Then click Next. Under the Destination field, specify the internal IP address we provided to you, along with the username and password. Keep in mind that the username must be in all lower case. 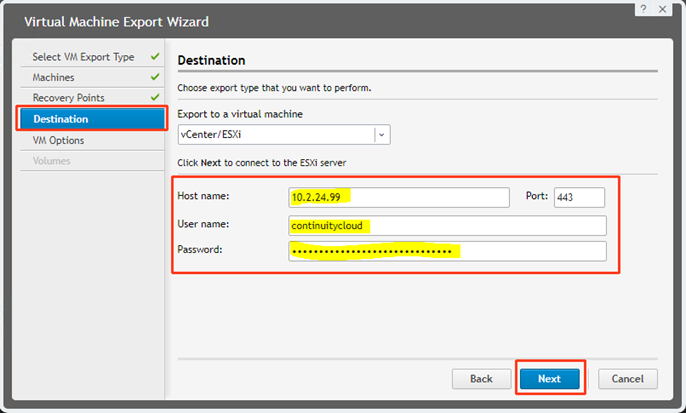 The example username used here is continuitycloud. 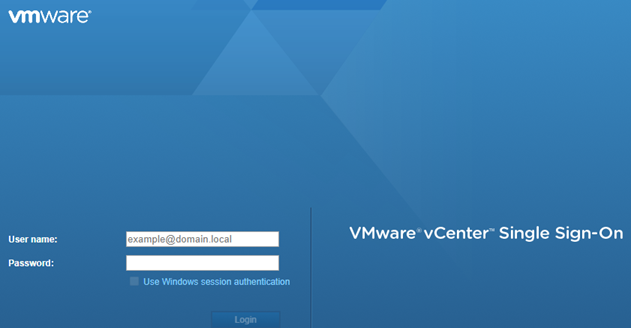 NOTE: The AD account we provided you is only used to access the vSphere WEB UI (to manage the node itself). 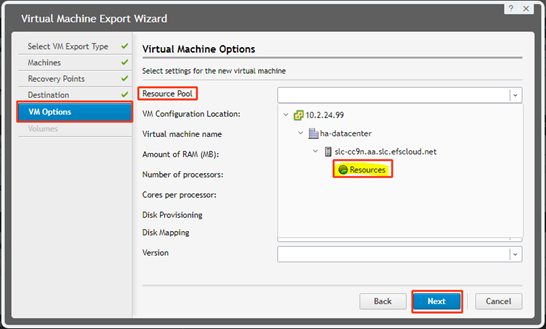 Under the VM Options section, select Resource Pool and then select Resources. The next section should auto populate. Please check the “Amount of RAM (MB)” section and specify how much RAM you would like.Leaving it at default will utilize what the agent has assigned to it, which may be more than what is available on the node you have. 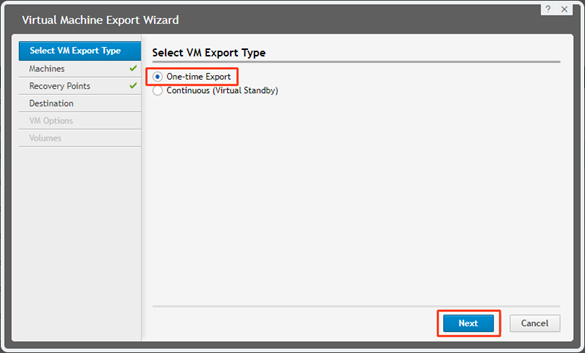 Please make sure to check mark the box “Perform initial one-time export”. This allows the Virtual Standby job to start right away. If this box is not checked, not, it will not start until the next incremental is received on the core. The rest of the items can be left at default unless you would like to change the “Number of Processors” or “Cores per processor” value. Under the next section, Volumes, check all volumes then click Finish. This concludes Section 3 on Virtual Standby. NOTE: When you export a VM and try to start it in VMWare, it may not boot due to a SCSI driver being set as the boot controller. This usually occurs only when exporting a Hyper-V VM over to VMWare. Before attempting to make any of the boot order changes, first try booting the VM up to see if it starts up on its own. If the agent comes up with an error like the one pictured below, please try to change the boot driver from SCSI to IDE. NOTE: DO NOT CHANGE THE BOOT DRIVER OR ATTEMPT TO INSTALL THE VMWARE TOOLS FOR THE PFSENSE VIRTUAL FIREWALL. THIS VM IS NOT RUNNING WINDOWS AND ATTEMPING TO CHANGE ANY SETTINGS OF THE VM MAY MAKE IT NON-BOOTABLE. Right-click on the agent name. The VM must be off to change the boot controller. Now, right click on the agent again and choose Edit Settings. (See picture below. )Click on the Virtual Device Node. Currently, it shows up as SCSI controller 0. Click the dropdown box and choose IDE 0. Then click OK to apply the change. Right click on the agent in question, click Power, then Power ON. 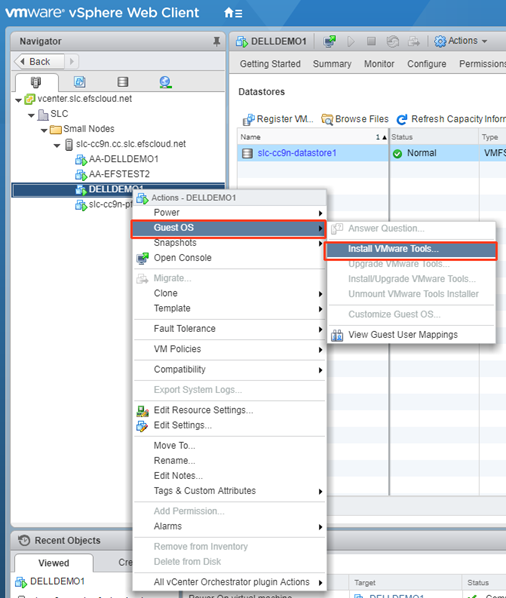 Once the VM is powered on, make sure to install the VMWare tools. Again, VMWare tools is only for agents you exporting. It is NOT for the pFSense Firewall VM. Right-click on the agent name in vCenter. Select Install VMware Tools… (as shown below). A box will pop up like the one that follows. Click Mount to mount the disk image with VMware Tools on the virtual CD/DVD drive of the virtual machine. 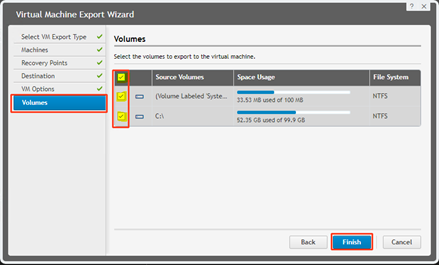 Then, go to the console to run the VMWare Tools install wizard from the virtual CD/DVD. At this point the mouse may not work yet since the tools have not been installed. If this is the case, you will have to navigate to the appropriate section by using the tab key on the keyboard. Or submit a ticket via the Axcient Portal.